It is late November and the rains have just returned to the Chyulu Hills, greening them. 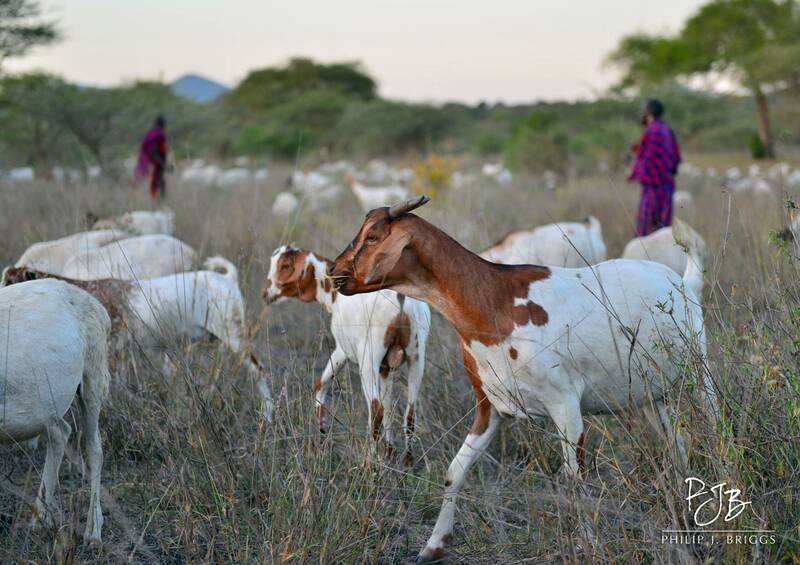 The two-year drought continues in the Amboseli basin to the west, currently a landscape of dust and desiccated carcasses, so the Chyulus are flush with not just grass but also Maasai herders and their livestock. They are hoping to find enough forage here to keep their animals alive until the rainy season arrives. If it arrives. I have traveled here with Philip Briggs, Lion Monitoring Manger for Lion Guardians and my CCC co-fellow, to look for a lioness who frequently traverses these impassable volcanic hills. Luckily for us, she is wearing a collar, which simplifies the searching process. However, it still won’t be easy to see her or count any potential cubs amid the lava beds and thick tropical vegetation. As dusk falls, we climb black-soil two-track roads, seeking a signal from her collar. Along the way, we pass herders moving their livestock back to temporary bomas, which provide nighttime protection from the lions, leopards, and hyenas that live here. The herders must be looking forward to a good meal after a long day of tracking their animals through trees and brush. As bone-thin cattle cross in front of the truck, a young heifer slips and falls hard. I hold my breath as she struggles to rise. She does, but it occurs to me that a single misstep can mean death for animals so close to the edge. Philip grew up here and has tracked lions from these roads hundreds of times. He drives as I stand on the back seat, body out the top of the truck, spotlighting for large, amber-colored eyes shining in the scrub. Though her collar signal tells us she is close, triangulation is difficult among the Chyulu’s volcanic cones, now faintly looming in the darkness. So we drive for hours, passing giraffes, elephants, and herds of gazelle, but no lions. The night air is warm and moist, strange constellations above. We stop for a late dinner of chapatis, tomato, and avocado that Philip, ever hospitable, prepares and serves. He thinks that the collared lioness, along with any cubs or pride-mates, may be on a kill and thus settled down for the evening rather than out looking for prey. We decide to search until midnight, taking signals from high points and driving the roads and open areas, after which we will set up camp to sleep and see if they move overnight. A few hours later, we call it a night. She is still close but apparently holed up. As we look for a camping spot, we interrupt a large bull elephant in the process of knocking over a tree. My spotlight shines in his eye and he blinks and grunts, seeming to give me an annoyed look. I apologize. Soon after, we pull into a small clearing and settle in to sleep, I on a mat on top of the truck, Philip on a cot on the ground. I worry about angry elephants and hungry lions, but Philip is unconcerned. As we drift off amid the calls of bushbabies, thunderous roaring suddenly erupts from above, echoing off the hills. We are instantly awake, listening to count individual lions. Two, three males? We scramble to pack the truck and make our way to a nearby clearing to play a recorded roar to try to call in whoever woke us, sitting quietly in the inky dark. It is unsettling, with my head and arm leaning out the window, to think that a lion could be a few feet away and I would never know it. I listen hard, but they never come. As we slide into sleep a second time, the roaring wakes us again, this time startlingly close. We again scramble into the truck and drive to the clearing, finding three alert but calm young males. Philip knows them immediately as the “Giraffe brothers”, originally a group of four brothers, one of whom died during a giraffe hunt, both lion and giraffe found dead in the same spot. We drive right into the middle of the group, each about 10 yards away, and turn off the truck. Philip takes photos for identification as I absorb the evening- the green Chyulu Hills, the Maasai herders and their animals, the elephants and giraffes, the warm air and the night sounds, and now these three handsome males. Philip interrupts to say, “Do you still have that voice recorder? Might want to get it out…” I close my eyes and feel their roars rumble deep in my belly, down through my toes. HEAR IT: Three male lions roaring at night – Listen with quality headphones and close your eyes for the best experience. Audio of three male lions roaring at night in Chyulus. Recording by Kevin Jablonski. Later, we fall asleep to more bouts of roaring, elephants crashing in the brush, and dogs barking from bomas. I wake to a misty dawn, raucous birds, and Kilimanjaro glowing to the west. 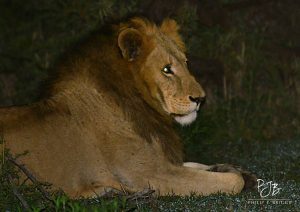 Philip, heating tea, says the males moved back uphill in the night, and that the collared lioness never moved. He will try again to find her a few weeks later and see that she has three cubs. As we return to the rain-starved plains, I think of the two seemingly opposing aims of our research. One is to understand how Maasai herders succeed year after year in such a difficult environment, and to see if we can do anything to make it a bit easier for them. I thus think of those herders, trying to keep their livestock alive in the face of immense challenges and rapid change, lying in their bomas listening to those lions. I think of the complex sociocultural web of awe, fear, respect, and violence, largely incomprehensible to an outsider, that ties people to lions. The other aim concerns those lions in the brush and the century-long decline of their species, which Lion Guardians has helped to reverse in this region. I think of them sitting there quietly, watching livestock walk by day after day. They too demonstrate tolerance, but only to a point. As Philip made clear by sleeping on a cot with three young males 50 yards away, the lions here have learned to fear people. A cow alone at night, though, is a dead cow–perhaps deservedly so. What do we owe such beautiful, terrifying creatures? Who am I to say? Despite continually losing their livestock to lions, Maasai here have never resorted to the extermination that North Americans continue to visit upon smaller carnivores for lesser threats. 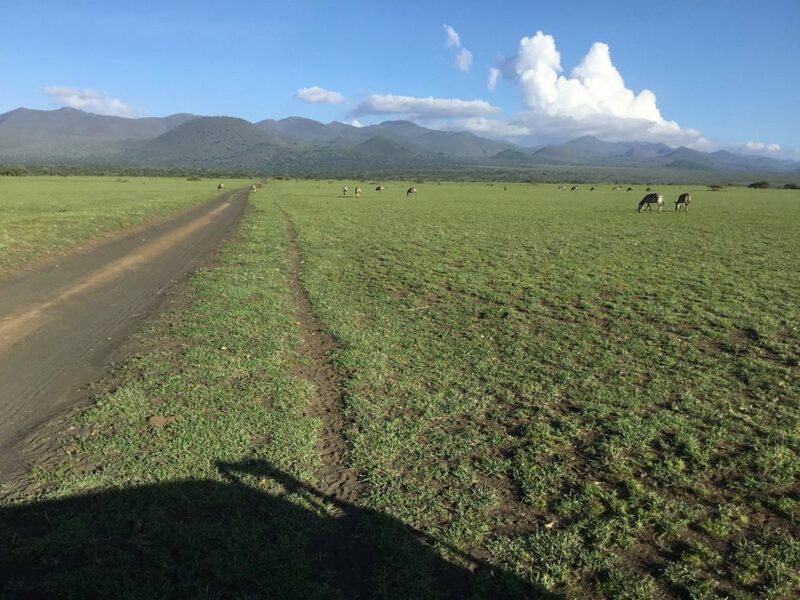 Nevertheless, increasing populations, land privatization policies, climate change, and habitat loss elsewhere present serious threats to the cosmo-ecological balance that the Maasai have struck with lions. The successes of Lion Guardians prove that conservation that values this balance can help preserve it, and that there is no necessary paradox in seeking gains in both human livelihoods and lion populations. But a night among the lions, herders, stars, and mists of the Chyulu Hills helps me to see how tenuous that balance is, how much the Maasai can teach the rest of us about tolerance, and how much I have to learn.